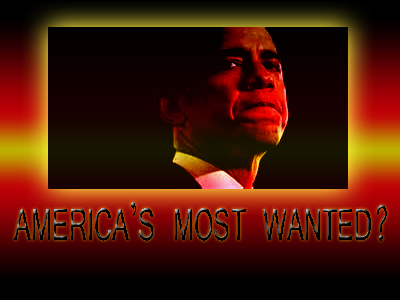 Is Obama Statistically Now The 'Most Wanted' Man In America? Let's consider for a minute what constitutes and determines what makes someone "most wanted"? Is it really the alphabet organizations websites like FBI list? The local police departments? But what about when possibly over half of Americans id not a lot more, that's around 150+ Million people can all agree that one person should be arrested and is wanted for the crimes he has committed, does that count for "most wanted" status? Does the 'most wanted' phrase really mean anything? Or is just a phrase stirred up by mainstream media from back in the organized crime days of the 1920's? Let's examine. Let's approach this topic from a statistical, logical and reasonable standpoint and lay out some facts. Criminals that are said to be wanted are really just "wanted" by a few police officers or agents who have done some research and concluded that a certain person should be apprehended. The phrase 'most wanted' predominantly comes from FBI's top "10 Most Wanted" program and infamous list on their site. TV shows have been spawned from this phase and the concept has been a central part of FBI operation for decades. Today the FBI has varieties of 'most wanted' lists including 'most wanted terrorist'. Yes this alone is reason to laugh if you know and understand the history of FBI sponsored terror! FBI also has ten 'Most Wanted' fugitives, even a section for 'more' wanted. Being 'wanted' is clearly the theme and we won't get into the details of why the FBI is willing to pay $$$ 1 Million dollars for the capture of one criminal, and only $100,000 for another while $2000,000 for yet another. The idea that the crimes they are wanted for determines the price tag is all fictitious in my opinion. In the last 2 years alone we've seen staged terror and shootings all over America with hired crisis actors, we've seen international staged terror to push us into WW3 with multiple hijacked and shot down planes. We are living in a world beyond anything George Orwell could have imagined with government getting away with crimes against humanity just so they can advance their long term agenda. FBI alone has been implicated in numerous staged terror plots and has been directly involved either by their non-action or by their action in facilitating the operation. With that said, let's move on from staged, useless and unreliable uses of the phrase 'most wanted' to a more concrete reality based application. Who then can be said to be truly 'most wanted'? This question may very well be answered with one person- Barack Hussein Obama. Where do I start my argument? For one, Obama snuck into the position of president without ever proving his legitimate eligibility to be president. When all the proof was provided that his birth certificate was a fake the establishment ignored it. From the fraudulent birth certificate long form openly posted on the White House site to waging illegal war without the approval of Congress, to scandals like Fast and the Furious, Benghazi gun running scheme and non-intervention, to the mysterious "drowning" of Loretta Fuddy, the ONE woman who could have proven his birth certificate was a fraud, to the unconstitutional power-grab of authority in signing one illegal executive order after another, to illegal drone killings including the criminal and illegal murder of American citizens, to the staging of the (longtime already dead since 2001) Bin Laden death hoax followed by Seal Team Six's (another group of unique men holding PROOF of an event that didn't happen and thus a threat to Obama) mysterious, coincidental, and convenient killing in a training exercise shortly thereafter. The list of weird murders is so long there is a building list of a so-called Obama 'death pool' said to range at over 70 deaths! The additional disappearances, staged false flags, illegal executive orders, aggressive foreign policies and expansion of wars goes on and on and on and are too many to count at this point. It would actually take a book to cover all the crimes this single man has committed yet amazingly and shockingly he holds the power to continue unscathed, un-impeached, un-convicted and un-charged. Serving as the next puppet president, NOT wanting to end up like JFK with a bullet to the head, the man has waged war all over the world just like the military industrial complex would have him do. The problem? We are dealing with an empire, a force much greater than Obama. Simultaneously we are dealing with modern day tyranny in a way that is too immense for most hypnotized Americans to fathom. The hypnosis is so intense that people are afraid to criticize the emperor or they simply see no big deal in anything he does. This is not surprising in a country which is one big psychological experiment on humanity. A country drunk on entertainment, distractions, senseless fascinations with primitive pleasures, silly trends, spoofs, simple minded stupidities and a mountain of stimuli intended to placate Americans. This whirlwind of entertainment has led many American into a seemingly permanent state of stupidity and senselessness where they are complacent and ignorant of all events going on and only process subconscious critical thought through the vehicle (or spell) of mainstream media hypnosis. This is exactly how we got to where we are now. Despite those that are asleep, given how many Americans are waking up to the new world order and given how many Americans (Republicans, Libertarians and others) don't like what they see because it's too obvious, as I pen this article I can now factually, statistically and mathematically state that Mr. Barack Hussein Obama is now the most wanted person in America. The amount of people who want him captured far outnumbers any criminal in the FBI website. He may not be captured and he may not be convicted for his crimes but he is factually the most wanted criminal in America. He may not even be impeached but that doesn't change the numbers. This is the nature of tyranny. The same tyranny that Obama himself boldly proclaimed to a graduating class at Ohio State last year (2013) that they were to NOT listen to the voices warning of tyranny. How ironic! Yes Barack Hussein Obama really is the most wanted criminal in America by all means and, using the FBI price tag system, I can't imagine what the price on Obama would be but it's probably a really big number. Unfortunately this call for Obama to be captured will be heard and treated as just another opinion thanks to the overwhelming power of political propaganda. Let this be a reminder and a warning to all Americans moving forward. We all saw how Bush and Cheney committed crimes and got away with it. We've now seen a foreigner occupy the White House, lie about every promise, murder Americans, defy the Constitution, illegally expand wars and arm terrorist and a lot more and get away with it. Warning to all Americans. The foundation of America is truly at stake and every American will have a decision to make soon. I hope you truly believe in freedom, the Constitution and American values given to us by the founding fathers. If you don't, then you are part of the problem unless you have an even better solution. What we are seeing is only the beginning and the criminality coming out of the Executive branch will only get much worse. Are you ready for this? As of this moment there is no reason to think that this problem will improve or that the next president (if there is one) will be any better. Irish political philosopher Edmund Burke said long ago that: "All that is required for evil to prevail is for good men to do nothing" and never has this been more true than now. Are you prepared to take a stand and take action? Or are you not a good person?